The mine, built in the 13th century, produced table salt continuously until 2007, as one of the world’s oldest salt mines still in operation. 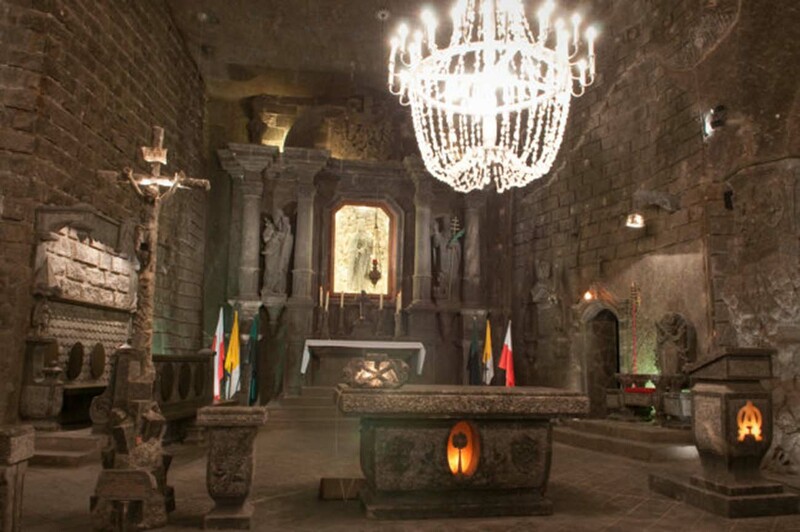 The mine’s attractions include dozens of statues, three chapels and an entire cathedral that has been carved out of the rock salt by the miners. In 1978 it was placed on the original UNESCO list of the World Heritage Sites. Today, the “Wieliczka” Salt Mine combines many centuries of tradition and modernity, the history of several hundred years and an underground metropolis with extensive infrastructure. There are 20 chambers to visit – the Chapel of St. King is the most brilliant one. The visit is always conducted under the supervision of a guide. There are 800 steps to climb of which 350 at the beginning take you down into the mine. Wear comfortable shoes. You will meet with our driver at your hotel/apartment, all our drivers speaks fluent English and on the way explain you all the details of your tour. Driver will pick you up from the hotel, apartment, hostel straight to Salt Mine. Than he will be waiting for you. After sightseeing Salt Mine driver will take you back to Krakow, wherever you wish. Salt Mine Private Tours - All prices are in Euro/Zloty per person.